For thousands of years, the Nile has been more than a river for Egyptians. The country is pretty much only the desert and the river. So it’s their lifeblood. 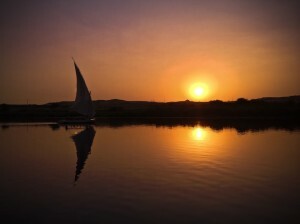 That’s why sailing down the Nile has always had a special place on my bucket list. The newest tick on my bucket list. On Busabout’s 10 day Egypt trip, I was given the chance to see a completely different side of usually-frenetic Egypt from the relaxed pace of a zigzagging felucca on the Nile. 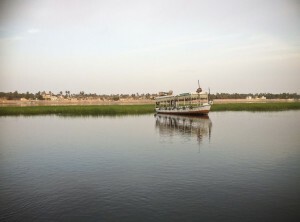 We sail from Aswan to Kom Ombo, about 50kms, over two days. This gives us ample opportunity to people watch. Three young Nubian kids having a blast with a rowboat. Cows grazing on small grassy patches in the middle of the river. Farmers driving from small shanty towns, presumably to market their produce. 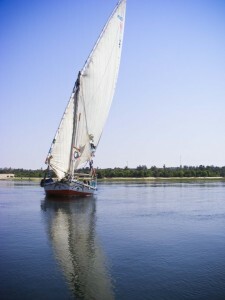 A typical scene from the side of the felucca. 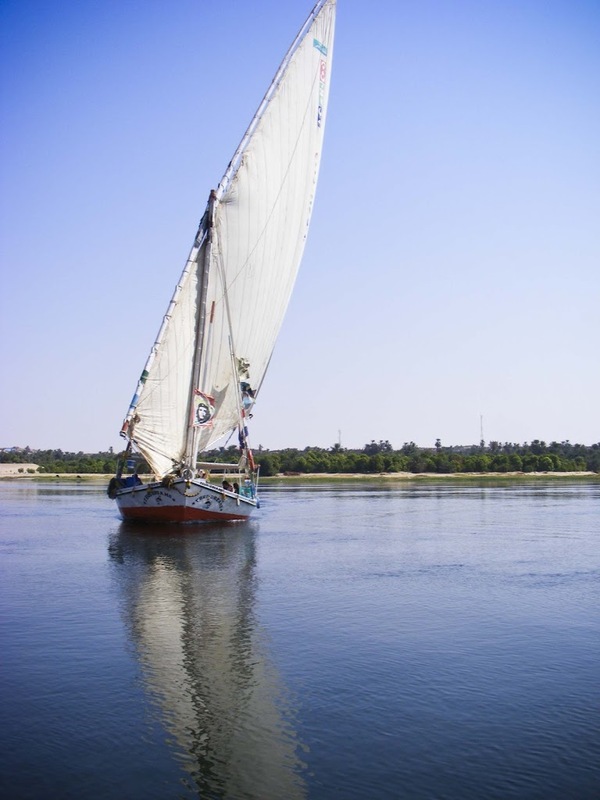 This is a traditional Egyptian felucca, so there are no cabins on board. The entire deck is an enormous mattress that we use for eating, relaxing and sleeping. There are no toilets either, so we improvise when ashore. 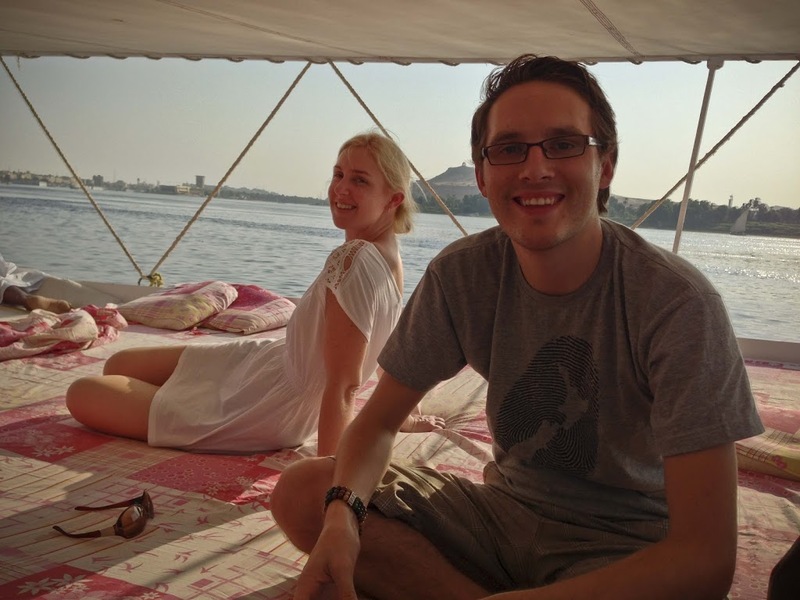 Lucy and Paul hanging out on board the felucca. 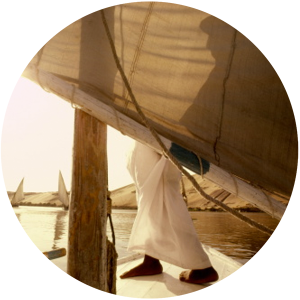 Meals are prepared for us by the crew, then served on long tablecloths down the centre of the boat. My favourite was spiced rice with potato curry and fried chicken – absolutely delicious. 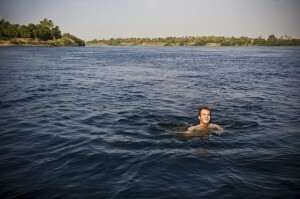 We pull up ashore regularly, which is a great chance for a quick dip. On the second night, we gather around a roaring bonfire. 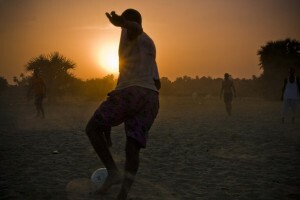 But first, while the sun is still out, some of the Busabouters are challenged to a soccer match by a group of local teens. After nightfall, the bonfire is lit, and our crew pull out drums and instruments which create the vibe of a hippie commune. By now, our group of 18 has bonded well, so some of us dance, some of us have deep and meaningfuls, and the rest sit by the fire and relax. Tomorrow, we return to the frenetic pace as we continue north to Luxor.